January and February in NYC are two of our least favorite months- it’s just so cold! So, we were more than happy to escape to the Caribbean last week to stay with several Marriott properties. We started in Orlando to see Tara’s sister, Shannon, and spent a few days exploring Disney World. Then, we flew to Puerto Rico for a quick stop at our favorite restaurant in Old San Juan, continued on to the Renaissance Carambola Beach in St. Croix (more on that soon), and finished our trip at the Frenchman’s Reef Marriott in St. Thomas! There’s enough to do on the property that you’d never have to leave- but if you know anything about us, you know we love adventures. One of the coolest things about Frenchman’s reef is their access to activities. There’s literally an “Adventure Center" desk in the lobby where you can book your Caribbean adventures- most of which leave straight from the resort! We booked a Catamaran sunset dinner cruise one night, and it was so romantic. They took us on a 2 hours sail with a nice buffet and an open bar (caribbean rum punch, anyone?). It was a perfect evening, and we got back to the resort with plenty of time to get dessert and drinks in the Sunset bar. On our last night we went Night Kayaking and it was so cool! The kayaks had see-through bottoms and LED lights shining down into the water, which made it so easy to see into the crystal-clear water below us. We saw enormous fish, stingrays, and even a sea turtle! Our guide knew everything there was to know about the marine life, and it was one of our favorite experiences of the entire trip! You can take daytime snorkeling trips, catch a ferry across the bay to shop downtown, take a boat trip to Buck Island National Monument (If you have time, this is one of the most beautiful beaches in the world and completely worth the trip!). No matter what your vibe is, there is something for you! St. Thomas has no shortage of beautiful beaches - so if you need to try something new off the resort, we loved Magen's Bay! Coki Beach supposedly has the best snorkeling on the island, so that's worth your time as well! While there are many restaurants in the resort to choose from, our favorite was Coco Joe's! It's an open-air beachside restaurant with good vibes and great food! Thursday nights they have all-you-can-eat seafood and bottomless Sangria for $55 per person, and it was absolutely delicious! We ate enough lobster, mahi mahi, shrimp and steak to feed an army, and sat talking and drinking sangria in the warm ocean breeze for hours - and there was live music! Breakfast here was equally delicious, and the breakfast buffet at Aqua Terra was to die for. 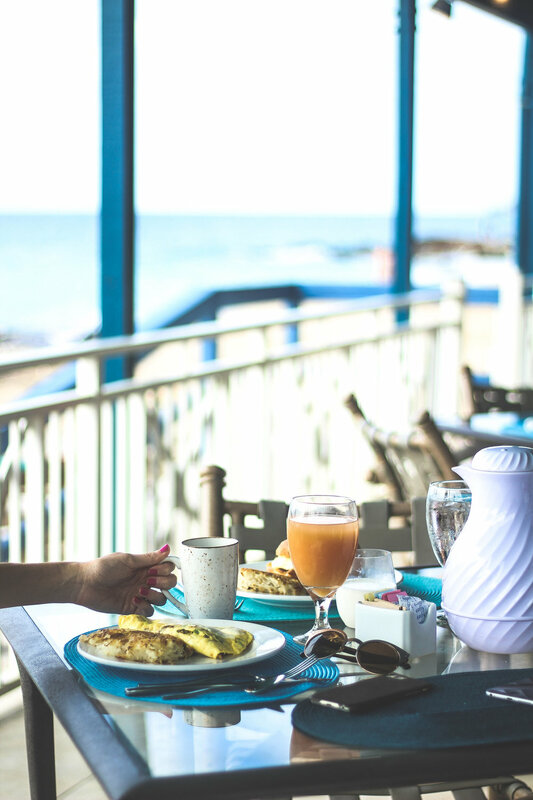 They say it's the best omelette bar on the island, and we don't doubt it one bit! Their local specialty omelette - spinach, okra and goat cheese - was worth the buffet price alone. Then there's the multiple other patio and poolside bars and restaurants. Great food, delicious drinks, wonderful entertainment and fun atmosphere everywhere! NOW... If you're a Bachelor fan, you'll know that tonight's episode was actually filmed at the resort! The one-on-one date was in a private room at Coco Joe's, and they stayed on property- which that speaks volumes to the calibre and quality of Frenchman's Reef! (plus, it was so cool to stay here the weekend before the episode aired!) Everything about this resort is well thought out and beautifully executed. From the bellmen and housekeepers to the sales team and management, the ever-smiling staff make you feel like you're family. It was the perfect end to an adventure around the Caribbean, and we couldn't more highly recommend the Frenchman's Reef Marriott. Thank you to this wonderful staff for hosting us- we'll definitely back! !